TULP I & KLEEFSTRA R (2018) Andermans Veren. 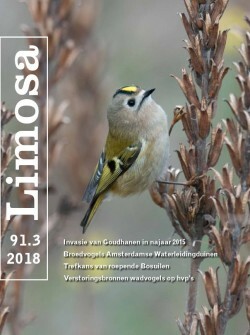 LIMOSA 91 (3): 128-130. Pérez-Camacho L., S. Martínez-Hesterkamp S. Rebollo, G. García-Salgado & I. MoralesCastilla 2018. Structural complexity of hunting habitat and territoriality increase the reversed sexual size dimorphism in diurnal raptors. Journal of Avian Biology, doi: 10.1111/jav.01745. TULP I Wat als een Pimpelmees alleen achterblijft? Santema P. & B. Kempenaers 2018. Complete brood failure in an altricial bird is almost always associated with the sudden and permanent disappearance of a parent. Journal of Animal Ecology 7: 1239-1250. Carneiro C., T.G. Gunnarsson & J.A. Alves 2018. Faster migration in autumn than in spring: seasonal migration patterns and non‐breeding distribution of Icelandic Whimbrels Numenius phaeopus islandicus. Journal of Avian Biology, doi.org/10.1111/ jav.01938.